St. Andrew offers diverse worship experiences to touch the spirit and nurture the soul beyond boundaries of age or culture. 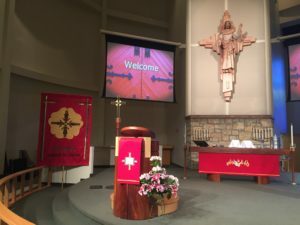 Weekly Messages are uplifting and relevant to Christian living in the “real world.” The worship experience is always enhanced with music and Holy Communion, and at times with visual media and the arts. Childcare is available during worship every Sunday and Monday. Hymns, liturgy and traditional Music with choir and instrumentalists – a joyful, worshipful setting with a little variety each week! Children are always welcome in worship. Childcare is available on Sundays from 8 am – 12 noon. Click HERE to check out our Sunday morning programs for kids & teens, too! Informal atmosphere including creative worship elements and a variety of contemporary Christian music led by our Praise Team. Wee Worship is a available at 11:00 for kids ages 3-8. An eclectic blend of liturgy and music including Sunday’s message and Holy Communion. For weekend workers, travelers, or anyone seeking a peaceful, encouraging start to the week! Childcare is available.